After many years without a dog in our house, we enjoyed the freedom of not having to rush home to feed and take care of a four legged family member, except for our very independent cats who let themselves in and out the cat door and fed themselves from self feeding dry food and water containers. Except for the occasional affectionate pet, the cats always led their own lives and we could also keep our schedules without interruption. It had been 10 years since our beloved Bear, our black lab mix had passed away at 15 years of age. We grieved for quite a while and then just got used to not having a dog around. We also knew there would never be another dog like Bear. He was so much a part of us that getting another dog would never be as wonderful as the joy that Bear had given us for so many years. Many years went by, and we didn’t seem to miss having a dog as a family member. One day, during a time that our company was working on a fund raiser for the local Humane Society, our office manager called and said that a stray dog had shown up outside the office and was howling a sad cry. She brought him in and fed him her lunch, as he was very skinny, obviously lost and really needing some love. She sent us a photo from her cell phone, and we came over to take a look. We were at a meeting with the director of fund raising for the humane society who showed up right behind us at the office. 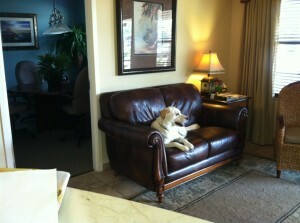 He was a beautiful yellow lab, just skinny and loaded with fleas. Another dog lover, one of our real estate agents, Linda Sears, picked him up and took him to the vet to get checked for a chip and also got him a pill to take care of his fleas. Now, we just had to figure out how to find his owner. We knew someone must be really missing him. Our secretary started calling around, and one of of our agents took him home for the night. My husband Bob had an immediate soft spot for this dog. We were all concerned how such a well behaved pet could have gotten away from his owner. The Veterinarian said that the dog had no chip, of course, and that he appeared to be about 3 years old and looked like he had been “on the loose” for quite some time. Still, we thought we could find his owner as he seemed to be a really special dog. A few days passed, and no one turned up to claim him. The agent who had taken him home brought him back and Bob and I decided we would keep him until his real owner showed up. We just knew someone must be missing him terribly. We knew how we would have felt if our Bear would have gotten lost. Several days went by, and each day Bob would bring the dog to the office, thinking that a call would come in and his owner would claim him. Meanwhile, we called him Max, Short for Re/Max. The dog would visit the agents and made “friends” easily. 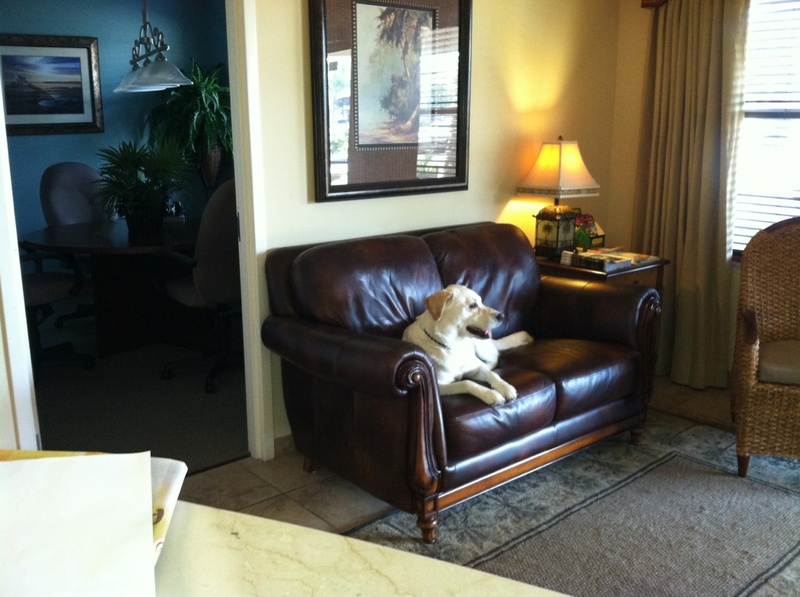 They enjoyed him and the novelty of having a dog in a real estate office. They brought in treats and toys and Max became more animated, happier and gained about 7 or 8 lbs. Weeks went by and no one claimed him. I searched the internet late one night and found an old newspaper article where a yellow lab had escaped an animal kennel a year or two ago and the owner was heartbroken. The owner also lived a few blocks from our office where Max had originally appeared. I thought this might be the answer to the puzzle, so I called her the next morning and described Max to her, but there was one distinct difference. Her dog had been neutered and Max clearly was not. I could see the relief in Bob’s face when this lady told us that Max could not have been her dog. I knew then that he would become a permanent member of our family, much to the displeasure of our beloved cat. It’s now been over 3 months, and it feels like Max has always been part of our family. He still goes to the office every day with Bob and we can’t imagine being without him. I would not have thought it possible, but we love him as much as we loved our wonderful Bear dog. We hope he will be with us for many years to come. I think he hopes so too.